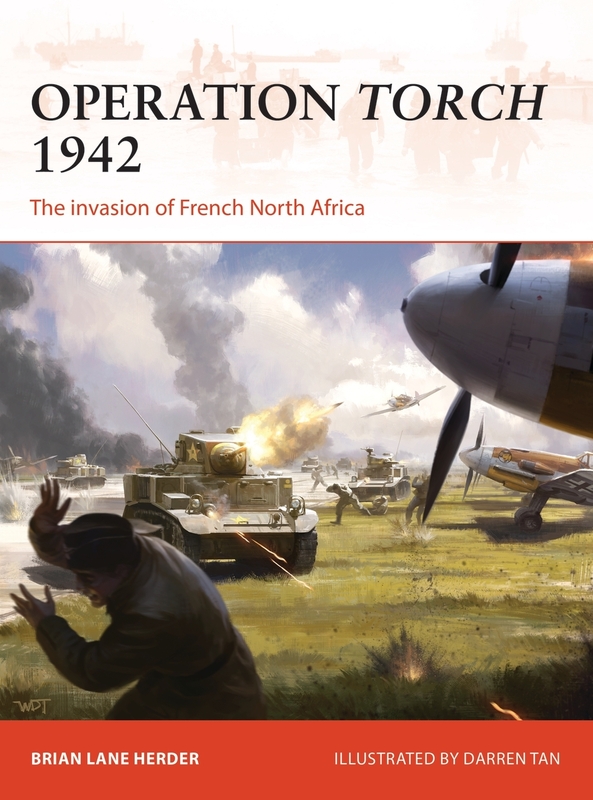 This month sees the publication of Operation Torch 1942, which follows one of the most complex amphibious invasions of the 20th century, the US-British invasion of French North Africa. Ahead of its publication, we welcome author Brian Lane Herder to the blog, who discusses how he chose this subject, and the writing of his first Osprey book. Without warning, on November 8 1942, a powerful Allied invasion force descended on French North Africa, permanently altering the course of World War II. Operation Torch is for its size, importance, and Anglo-American origin – somehow one of the most overlooked campaigns of the war. I am Operation Torch 1942 author Brian Lane Herder. Even in my youth I was generally well-versed in the United States' battlefield contribution to defeating Nazi Germany, but for years the campaign that started it all had long remained a mystery to me. Embarrassed of my ignorance, several years ago I became obsessed with reading every Operation Torch book I could find. Two obvious standouts are the official US Army "green book" history, Seizing the Initiative in the West, and Rick Atkinson's 2003 Pulitzer Prize-winning, popular history An Army at Dawn. The bewildering political, geographic, and military complexity of Operation Torch ­­– roughly eleven major simultaneous air-sea landings across 1,000+ miles of coastline (Overlord had about seven across 30 miles of coastline) – inspired me to research, organize, and ultimately write my own Torch narrative, mostly so I could personally make sense of what actually happened. Fortunately, Osprey Publishing eventually commissioned me to write a Campaign entry on this truly fascinating episode. There are so many mindlessly repeated myths about Operation Torch one wonders where to start. When I began my journey, I expected to mostly reconfirm the old story, hopefully present it more clearly than before, and have fun doing it. Instead the more I dug up old primary sources, the more I found myself getting angry with the scripted way "history" is so often presented. This was no glorified handover, this was a nasty fight. For example, an Allied battalion at Oran was effectively annihilated by French defenders in half an hour. I eventually compared total Allied Torch fatalities against the French with Overlord's first day of fatalities against the Germans – D-Day. Given the vast discrepancy in ink and plaudits spilled on the two landings, I found the numbers surprising. Another myth is that Operation Torch ended when the French quit fighting on November 11 1942. In fact, the stated mission of Operation Torch was the total Allied conquest of Tunisia before winter. Torch therefore entailed major hostilities against the Germans and Italians and officially lasted until December 25. Osprey's Campaign entry follows this timeline accordingly. Operation Torch additionally boasts the largest naval action in the Atlantic theater, the strangely obscure Naval Battle of Casablanca. This purely Franco-American showdown would easily rank amongst the top six or seven naval battles of the Pacific. As I explored Torch, I was surprised to fully perceive the US Navy had been involved in a genuine Atlantic slugfest. Torch is easily the most politically-complex and politically-driven major operation of World War II. At least six major nationalities significantly shaped Torch as belligerents or potential belligerents, while the French alone can be divided into five or six major separate armed factions. Researching and relating Torch's endless political machinations and cloak-and-dagger intrigues was one of my favorite aspects of the project. While ample seamy exposition remains, ultimately Campaign is a battlefield series, and some truly fascinating stuff found its way to my chopping block. Unfortunately, much of Spain's significant influence on Operation Torch had to be excised, but that story is more appropriate for another study. I felt that I could fashion a new title around Operation Torch that could fulfill these requirements. The 96-page Campaign format initially strikes one as a limitation, but in practice it proves a major asset to both author and reader. Pick up just about any "scholarly" work and really parse the author's words and the chances are, much of the text does not actually impart the reader with new information. I suspect at least 80% of my writing time was spent not staring into a blank screen, but eviscerating old sentences and re-writing them with 2–3 fewer words, while keeping the same information. By the time I'd done this to every sentence in the book (many times), there was enough space left to add more actual information! A win for both the author and the reader. I began my overall research studying and drawing from the many consistently excellent official/semi-official histories of the US and British militaries and governments. I then started drawing from the best secondary sources I could find – I didn’t obtain one of the very best until my first draft was nearly complete. I eventually started getting into the weeds with primary sources, such as official reports, statistics, and so on, in order to add hard numbers and details, to truly "get to the bottom" of military actions and commanders' motivations, and also often to confirm (or refute) questionable claims from secondary sources. I drew as much as possible from difficult-to-obtain French and Italian language official histories, as well as an American work that functions as an ersatz Luftwaffe history. Additionally, official reports and well-researched, well-annotated popular histories proved useful for colouring the narrative with fascinating anecdotes and quotations from Torch participants. I suspect the actual majority of my research hours was spent scouring obscure sources for tiny little details I had long wondered about, but had never actually seen included in a Torch narrative before. I think the effort was worth it, and I hope the reader enjoys the detail too. I'm often frustrated by the way large campaigns are presented in many works. Most modern campaigns are combined arms battles (especially amphibious invasions). Therefore, in addition to the land combat, I strove to give the air, sea, and logistics aspects their proper due. Another personal frustration is a clear national bias by the author – although American, I sought to be as proportionate and even-handed as possible. My writing style tries to illuminate a top-down view of commanders and strategy, yet also include plenty of little anecdotes of the men and junior officers in the field. After all, they are the ones who ultimately fight wars, and they sacrifice accordingly. Additionally, I don't believe any human endeavor can truly be understood without sufficient context, so I like to throw in little relevant bits of local politics, history, culture, climate and terrain, so long as I can keep the combat narrative smooth. Ultimately, a book is only as good as its ability to clearly and understandably impart its information to the reader. If I can't learn something from a book, then what good is it? If lots of maps, photos, illustrations, and tables help me learn something new, I want to see them in the books I read, and this is another of Osprey's strengths. Every battle/campaign owns at least a few iconic images. Without them, no narrative truly feels complete. Who wants to read about Iwo Jima without Joe Rosenthal's flag-raising photo? However, a book with nothing but retread imagery feels like a rip-off. I therefore spent much time seeking fresh photos and illustrations, particularly in original colour, since the Campaign series supports that. I sought to include a mix of essential iconic Torch photos with photos and illustrations that were new. Many of the images in Operation Torch 1942 have only appeared in commercial print for a few times, and a few of them have never been seen before. I was motivated to pick unusual and action-packed scenes for the three battlescene artworks. To my knowledge, none of these scenes have ever been illustrated before. It is here that I'm going to praise Operation Torch 1942 artist Darren Tan, whose interpretations of the selected scenes I find simply outstanding. I feel privileged to have been paired with him on this book. I have surely enjoyed working on Osprey's Campaign Torch entry. Like most of you, I own scores of Osprey titles on my bookshelf. I am more than simply fortunate enough to add to the pantheon, I am also part of the Osprey fanbase myself. Like it did for me, I hope Operation Torch 1942 will help other Osprey fans better appreciate one of World War II's most complex, misunderstood, and overlooked campaigns. Operation Torch 1942 is available to order now, and will be published on 21 September. To preorder, click here. I too suggested op torch. Very much looking forward to this book, will fill a big gap in my collection. I also liked the blog from the author, nice to see an osprey fan getting to write a book on a subject they are clearly very interested in. I'd also like to thank c-bone's mention of the reuban James. I've not heard of this, so looked it up. A very interesting story. Thanks all. As usual, thanks to the author for sharing insights into his creative process. My appetite is seriously whetted for the arrival of this book. Nevertheless I do find it hard to believe that one book will do the subject justice and I hope that Osprey will one day commission a book that concentrates on the naval aspects of this campaign. "Torch" took place at the height of the U-boat campaign, I would be very interested to learn how the many landing convoys were protected against this threat. I've also put Torch in the suggestion box once or twice. As for the bar trivia question, what about Reuben James? Or are you counting from US-initiated offensive operations? About time,been asking for an Osprey "Operation Torch" since I don't know when although an "Essential History" might have been better than a "Campaign".Yes if you want to win a bet in a Bar ask who the US Navy first fought in Europe in WW2 and when you say it was the French most people don't believe ya.LOL. I never knew Allied Torch casualties were particularly heavy. Where would you suggest looking for Spain's role in Torch?